They’ve decided to do things differently for the next collection (spring & summer 2009), called “Back to Basics”. There will be clothes and dolls. But instead of selling all the things piece by piece, they’re doing sets. Two sets, one dark and one light colored. 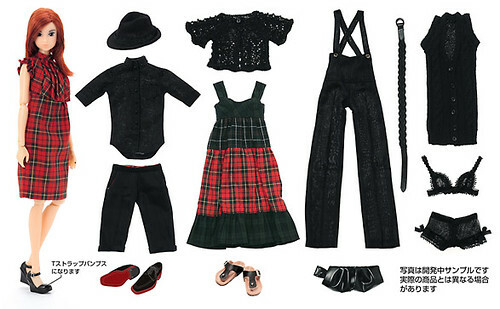 Each set comes with one doll, 6 pieces of clothings (plus the clothes the doll is wearing), 2 pairs of shoes, 3 accessories and one lingerie set. A whole collection in a box. 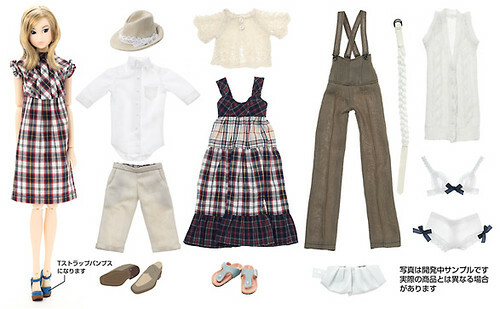 Perfect to start a Momoko wardrobe, as there’s a little of everything, and you can coordinate the pieces together in many different ways. It seems the sets will only be available through preorder, and there will be nothing else in the spring/summer collection. They’ve started taking preorders at the end of january, and will stop on March 10th. I guess their point is to know in advance how many sets they have to produce, so they (or their handling shops) won’t have any stock left for months. In the current economical context, it’s the best solution for them I guess. They’re sure to sell each piece, as they all come together, so you take even those you like less. It’s up to you to sell them after if you want, it’s not their problem. And maybe they even sell more than usual, because people who might be a little short, and who would think “Okay, maybe I’ll wait a little to take this.” with the regular sales are afraid not to get anything and pushed to reserve the sets to be sure to have them. In one way, those sets are a very good thing. There are really beautiful pieces in there. And as I said with one set you get a whole new wardrobe, with some stunning pieces and more basic ones that are always usefull (like the solid white or black shirt). And you get the whole thing for less than what you would have paid if they sold the pieces and dolls one by one. But here’s the thing: most of us don’t buy all the pieces from a collection. There is always something we like and something we don’t like. 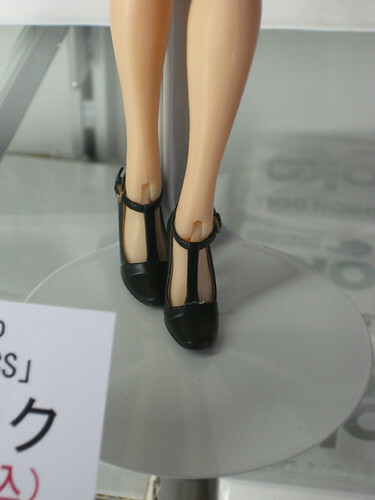 And CCS dolls and clothes are expensive, so many of us can’t afford to buy so much. Sure you make a good deal here, but you still have to pay everything at once. In the current economic contest, I’m sure a lot of us can’t do that. And this is why I’m disappointed at CCS for doing this. I know a company has to make profit, and can’t think of everyone. Because of its price range, I guess CCS clothes can be seen as luxury. But not this much! Not before… before, it was a real excitement to discover the new collection. I could look at all items, and dream. Dream that maybe I could get one piece as a gift for a special occasion, or dream I could spare enough money to get this one beautiful item before it got sold out. It won’t necessarily become true, but there is a chance. Here, there is no chance, and I can’t dream. It’s either take everything now, or have nothing. The only way to get items is if others you buy the sets sell some of them, and it will probably be through auction and prices will increase like crazy. Since I’m in Japan, I have the chance to be able to buy my CCS clothes in the handling shops, at retail price, not Ebay prices. I can’t even afford retail price right now, so I really can’t afford Ebay prices… ^^; I’m a little sad that Petworks won’t offer anything for those of us who have a little less money. I know Japanese persons spend a lot more than we usually do (especially in France I think), but I’m sure there are also Japanese people who buy only one or two pieces of CCS collections. They’re not here to think about those who have less money, I realize that, but when you like a brand you’d like to believe that they care a little about you. 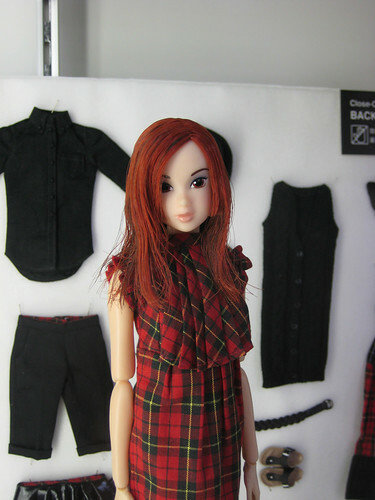 And I love CCS clothes, they’re so beautiful and well made, and fit Momoko perfectly. So I don’t want this brand to become an even more luxury brand intended only for very rich people (or people who are willing to sacrifice a lot to their dolls, something that I can understand but can’t do). Anyway, for those who have ordered them and can’t wait to see them, those who are hesitating or those who still want to dream (or torture themselves, you choose), I’ve seen the sets which were exhibited at Akihabara’s Azone shop, and I took pictures. This is a little introduction, you will find all of them on my Flickr (I’m uploading them, they’ll be visible once this post and its French counterpart are published). Thank you so much lholy chan!! !